As regular readers know, I spent last week in Napa Valley doing a five-day harvest immersion with the Stags Leap District Winegrowers. Over the next few days, I’ll be detailing my activities. Day one began just before 7:00 am. I arrived at Chimney Rock Winery, where Elizabeth Vianna, the property’s winemaker and general manager, promptly handed me a brand new pair of rubber boots and put me to work. We began with a quick check on the vineyard workers to see how the morning pick was progressing. (In a word, quickly!) We then walked a few vineyard blocks to sample grapes – most of which were just days away from harvest. The grapes were delicious, but most of the seeds were still too green. Elizabeth explained that once the seeds turned brownish/red — and once the skins fell off a bit easier — it would be time to pick. Chimney Rock's harvest crew picking grapes. Elizabeth then brought me back to the winery, as several tons of fruit had been picked that morning. The bin underneath the destemmer was rapidly filling with grape stems, so I was put in charge of monitoring the bin, replacing it when full, and cleaning out the bins once the stems were removed. 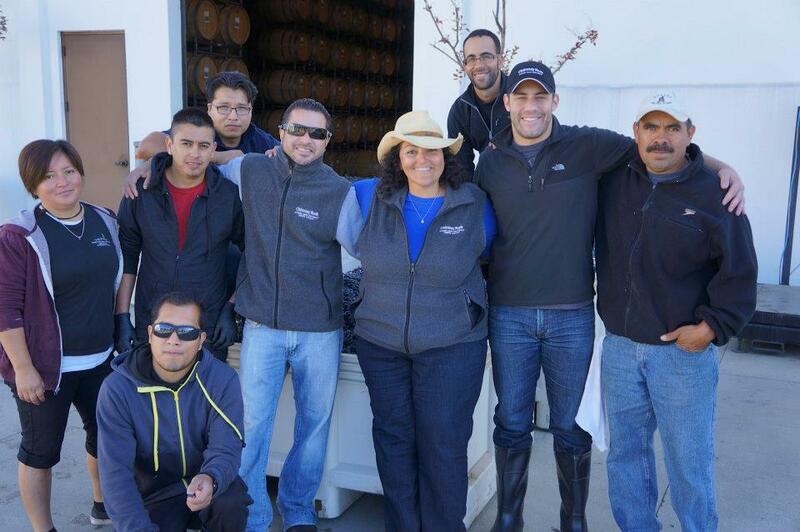 Chimney Rock's winemaking team, lead by Elizabeth Vianna. At 9:50, I hopped in my car and drove to Clos Du Val, where winemaker Kristy Melton quickly put me to work raking out a tank with the world’s heaviest metal rake. Once the tank was cleaned out, John Clews– Clos Du Val’s COO and Sr. Winemaker — joined us to taste through virtually all the tanks. It was fascinating to see how the different tanks were progressing. 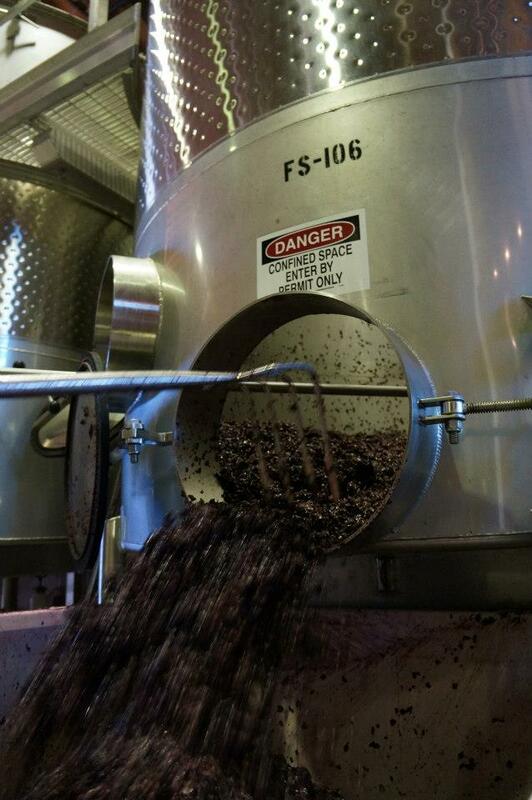 Raking out a tank at Clos Du Val. After making our way through the tank samples, John, Kristy, and I sat down to a takeout lunch from Napa’s Soda Canyon Store and discussed all things wine — how they both ended up at Clos Du Val, what they like to drink, etc. When lunch wrapped up, John put me to work with some punch downs. At 1:50, I hopped in my car and drove to Shafer Vineyards, where Doug Shafer proudly showed me the winery’s sorting operation — and then put me to work with the sorting crew. The sorting crew at Shafer. The work, as one might guess, was mind-numbingly repetitive. So I was thrilled when Doug came to rescue me after about 30 minutes and offered a tour of the property. 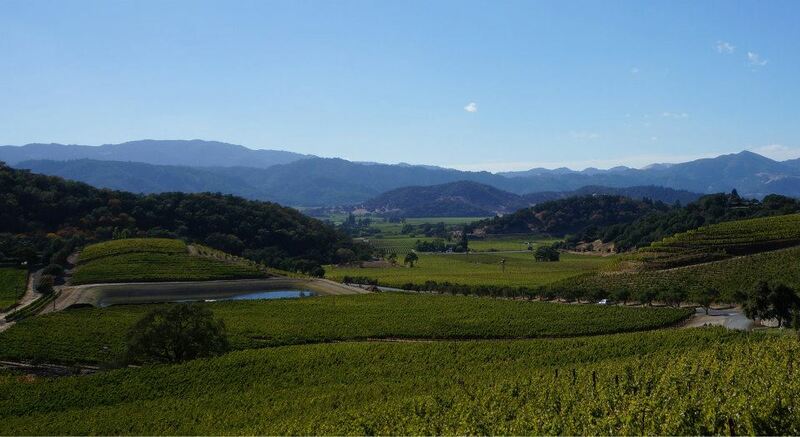 As many readers no-doubt know, the view from Shafer’s hillside (where the Hillside Select is sourced) is jaw-dropping. Doug then introduced me to wine and travel writer Andy Demsky (who helps Shafer with its PR efforts), and together, we tasted through the winery’s lineup. While it wasn’t exactly the work I signed up for, it was a perfect way to end my first day! The view from Shafer's famous hillside. I thought you weren’t getting paid — that tasting at Shafer is worth like 50 bucks! GIVE ME A PAIR OF BOOTS! I’d love to do this! It’s now on my bucket list!